Water vapor jets that spew from the surface of Saturn's icy moon Enceladus are not really geysers from an underground ocean as initially envisioned by planetary scientists, according to a study led by the University of Colorado at Boulder. First observed following a close flyby by NASA's Cassini spacecraft in July 2005, the jets were found to consist of both water vapor and icy particles, said Professor Nicholas Schneider of CU-Boulder's Laboratory for Atmospheric and Space Physics. The jets inspired speculation by planetary scientists that they were geysers -- violent explosions of water out of a vent caused by expanding bubbles of water vapor emanating from an ocean beneath the icy crust of Enceladus. Scientists hypothesized that if such an ocean did exist, it might provide a suitable environment for primitive life forms, said Schneider, who led the study. "We wondered if there was an ocean underneath that crust and wondered if it is just spraying out through cracks like a geyser boiling away into space," he said. To test the theory, Schneider and his colleagues performed experiments to find the relative content of sodium in the water vapor component of the jets. If the jets were geysers originating from an underground ocean, then the sodium content in the water vapor should be high. Schneider said such sodium should give off the same yellow light that comes off street lights, and that the world's best telescopes can detect even a small number of sodium atoms orbiting Saturn. Observations by Schneider's team using the 10-meter Keck 1 telescope and the 4-meter Anglo-Australian telescope, however, demonstrated that few if any sodium atoms existed in the water vapor. "It would have been very exciting to support the geyser hypothesis. But it is not what Mother Nature is telling us," said Schneider. The study was published in the June 25 issue of Nature along with a companion study by other researchers that analyzed the icy grains that also make up the expelled jets. The companion study concluded there was at least some salt in the particles in the plume, suggesting the particles may have come from an ocean. "Since our observing team did not find salt in the vapor, our conclusions speak to the conditions of a possible underground ocean on Enceladus," Schneider said. One suggested explanation for the contrasting results from the two studies is that deep caverns may exist where water evaporates slowly, said Schneider. When the evaporation process is slow the vapor contains little sodium, just like water evaporating from the ocean. The vapor turns into a jet because it leaks out of small cracks in the crust into the vacuum of space. "Only if the evaporation is more explosive would it contain more salt," said Schneider. "This idea of slow evaporation from a deep cavernous ocean is not the dramatic idea that we imagined before, but it is possible given both our results so far." But Schneider also cautions that several other explanations for the jets are equally plausible. "It could still be warm ice vaporizing away into space. It could even be places where the crust rubs against itself from tidal motions and the friction creates liquid water that would then evaporate into space," he said. "These are all hypotheses but we can't verify any one with the results so far," said Schneider. "We have to take them all with, well, a grain of salt." Maybe I'm missing something here but is there any reason that ALL oceans have to have a salt content? And, is a salt content necessary for life to exist? 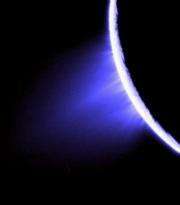 BBC reported 2% salt in vapor degassed from Enceladus. That ocean under Yellowstone keeps getting smaller. Why look only for sodium. Is that because we have sodium in our oceans here on Earth? Are we trying to find out why the jets exist, or looking for evidence of life? If looking for life, it's a long ways from sodium in the water vapor to life on Enceladus. I wouldn't read much into this finding. "Jets on Saturn's moon Enceladus not geysers from underground ocean"
If I recall science class correctly, our ocean is salty due to the evaporation process and the dissolving processes that build up salt over time, eons. How could the ocean, if there is one, on a moon near Saturn be affected the same way as our ocean, thus making these observations unreliable at best. No, there isn't. An object in space could pretty much be made of anything at all, though it is highly unlikely that anything formed in the "standard model" would be perfect pure and free of contaminants. 2) Sodium is definitely required for any organic life that I am aware of that exists on earth, as are a host of other metals: iron, magnesium, calcium, phosphorus and potassium and etc. All of these metals make up trace amounts of various biological molecules found in your body. For example, ADP and ATP are absolutely essential for life in the animal kingdom. While someone might be able to postulate a biological lifeform "somewhere" which does not need or use sodium, it is highly unlikely such an organism exists. Even if an organism did not actually "use" the sodium in biological structures (cells/organelles), it would likely need to metabolize it anyway, or risk poisoning itself.